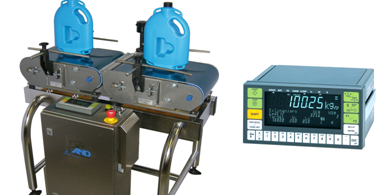 Australian designed and made, the AD-4404-High Capacity Series of Dolphin Checkweighers are manufactured from stainless steel to suit the requirements of HACCP and can be configured to suit a wide range of products for medium speed packaging lines, with a weighing range of up to 30kg. The open tubular frame minimises surface areas for dust and debris to accumulate. The 'non tool' quick conveyor release mechanism allows for simple ease of access for maintenance. Industries: Chemical, Dairy, Fish, Meat, Pharmaceuticals, Poultry etc. Products: Bottles, Boxes, Cans, Pouches, Satchels, Tray, Tubes etc. A&D's Dolphin Checkweigher - Proudly Australian Made.